The Shock Pulse Generator (SPG), developed and manufactured by Swiss company Explosion Power GmbH, is an online boiler cleaning equipment automatically generating Shock Pulses (SP) by pressurized gas combustion. The innovative technology has proven its outstanding performance at worldwide more than 500 different installations in 20+ countries since 2009. Plant operators confirmed significant prolongation of boiler operating periods and increased efficiency, thus contributing to a sustainable and economic plant operation. Leading plant suppliers decided to apply SPG-technology to new build plants, additionally profiting from the sophisticated system design and the compact geometry. SPG-technology hence is installed to all boiler regions and therefore replaces existing boiler cleaning equipment as soot blowers, shot ball systems, water canons, rapping systems, sonic horns and shower cleaning systems (SCS). Shock Pulse Generators are manufactured in Switzerland, from special high pressure and high temperature resistant stainless-steel qualities and other high quality components. Quality assurance includes hydrostatic pressure tests as well as explosion tests. Shock Pulse Generators are CE-certified as pressure equipments of Category II and III respectively. The Shock Pulse Generator is available within two different type series, the EG10 and the Twin type series. 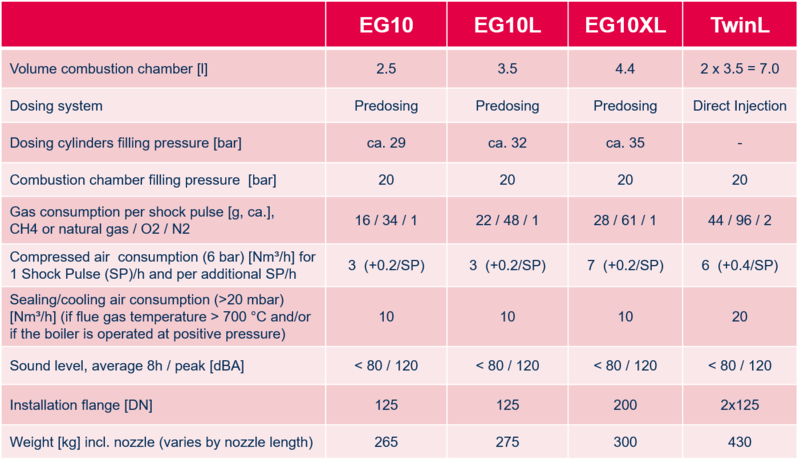 A design description of both type series as well as a table with technical information can be found in the following picture series. After release by the control, the dosing tanks of the Shock Pulse Generator are filled with Oxygen and Natural Gas. The two gases remain completely separated from each other and are not ignitable. The piston is pressed against the valve seat by Nitrogen pressure and closes the discharge opening gastight. 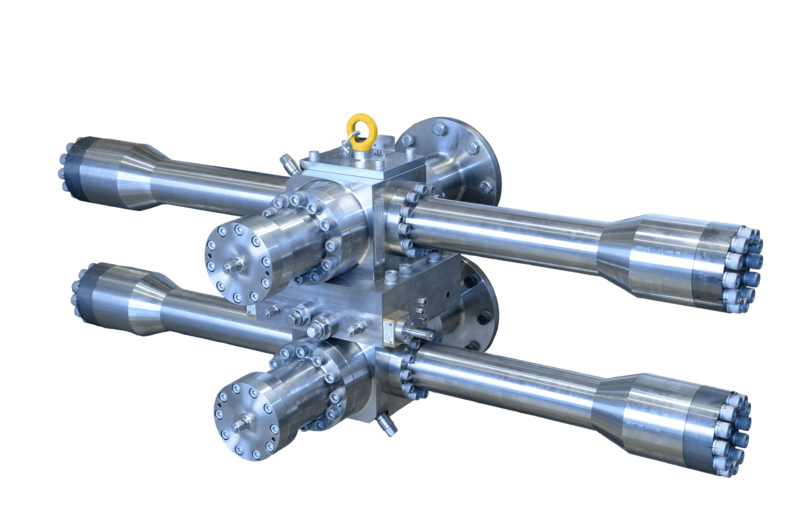 By opening the transfer solenoid valves, the two gases flow through the transfer valves, non-return valves and flame backstroke barriers into the combustion chamber, where they are mixed and therefore ignitable. The combustion is ignited by a glow plug. The pressure increase in the pre combustion chamber to approx. 350 bar moves the piston backwards. 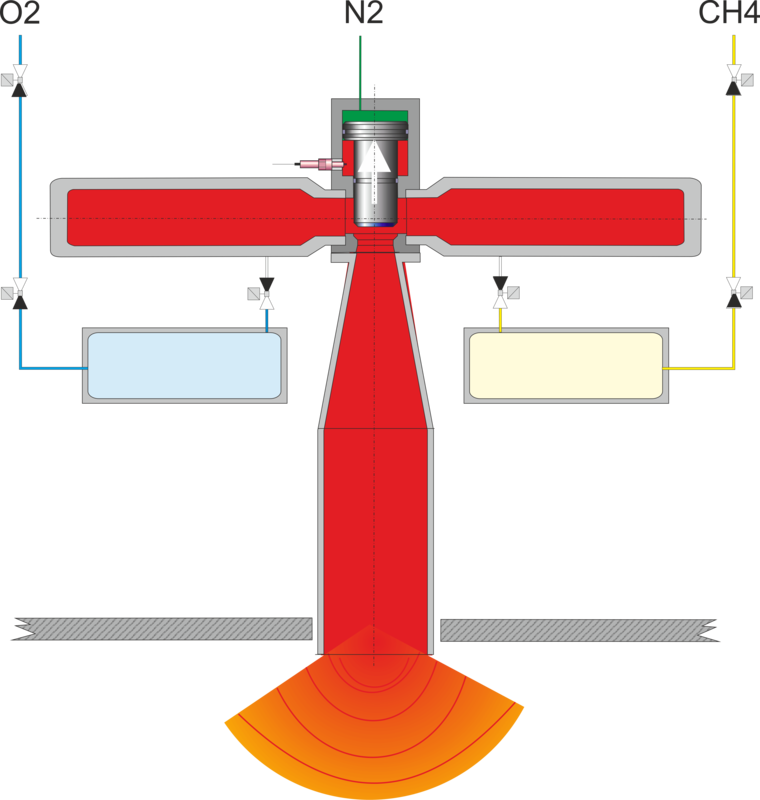 The piston therefore opens the discharge and the supersonic shock pulse of the main combustion chamber is introduced into the boiler. 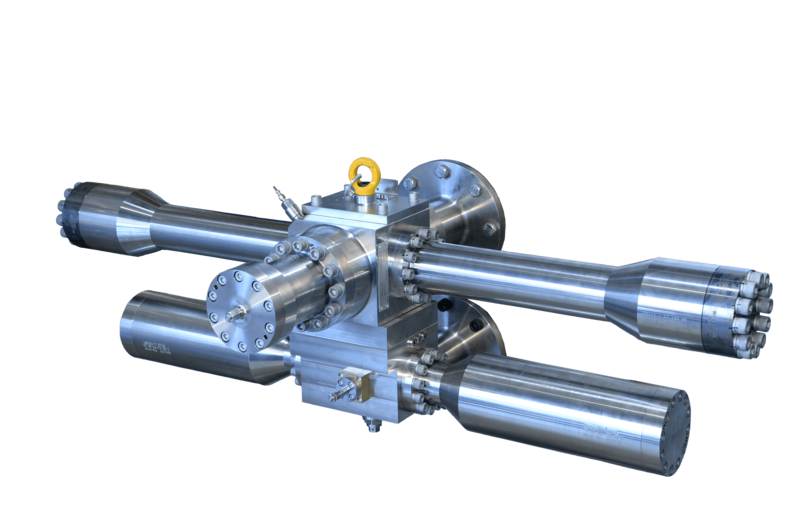 The discharge nozzle transfers the shock pulse into the boiler, where it propagates first linear, then spherical. Flue gas, boiler tubes and walls are put into a short oscillation, so that deposits are cleaned off.The effective depth and cleaning effect can typically cover up to 10 m, with best cleaning results for boiler tubes and walls capable of oscillation. 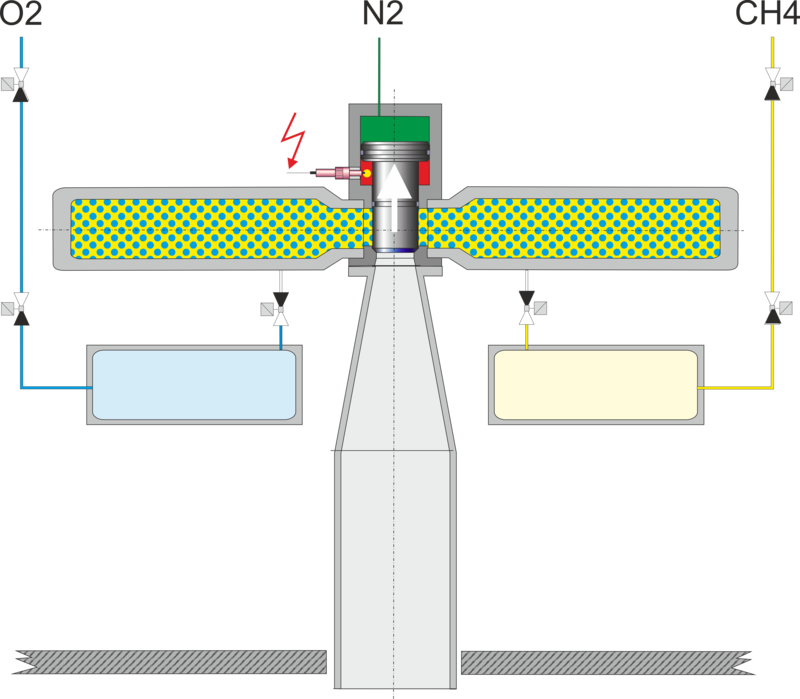 After the pressure wave was discharged from the Shock Pulse Generator, the piston is pressed against the discharge opening by the Nitrogen gas spring and closes the generator gas tigth. The Shock Pulse Generator is then ready for the next pulse cycle. After release by the control, the Shock Pulse Generator is filled with Oxygen and Natural Gas. The two gases are mixed during filling by means of a static mixer. The two pistons are pressed against the valve seats by Nitrogen pressure and close the discharge openings gastight. 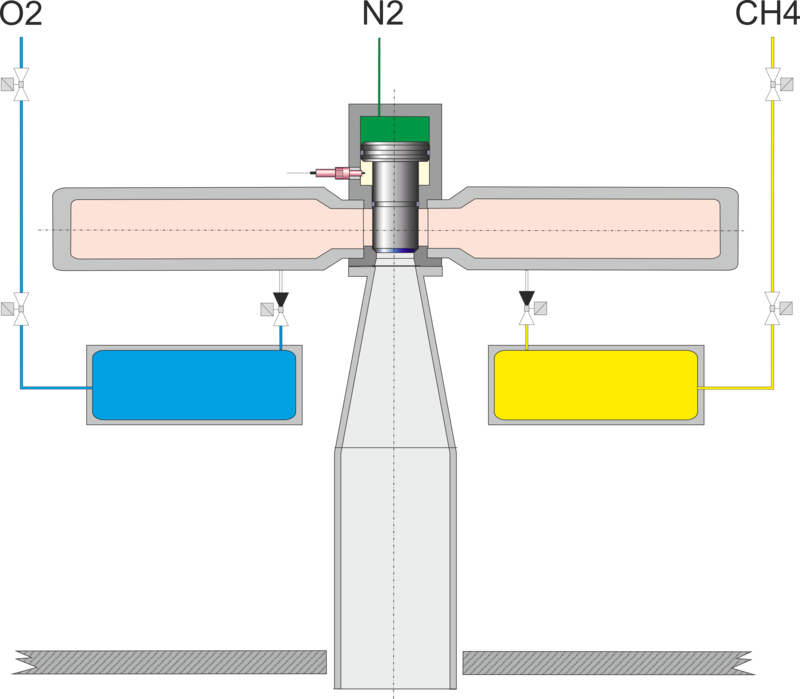 The two gases are in the combustion chamber in a mixed state and hence combustible. The complete system is tested for gas tightness by the PLC. The filling valves are closed. The combustion is ignited by a glow plug. 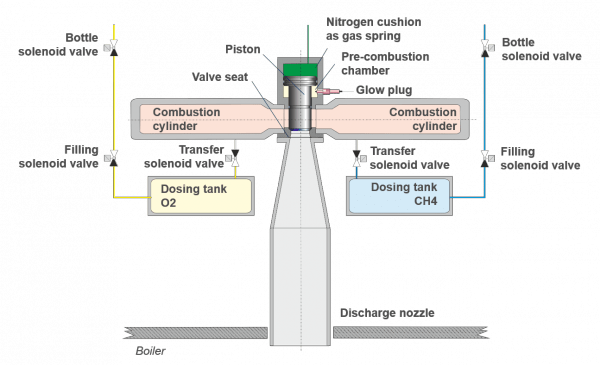 The pressure increase in the pre combustion chamber to approx. 350 bar moves the pistons backwards. 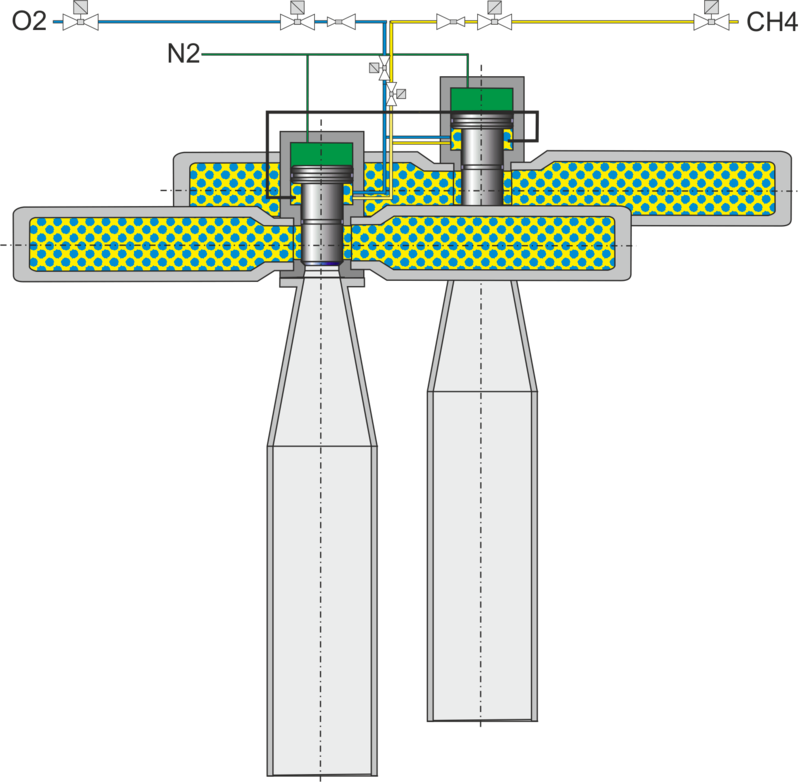 The pistons therefore open the discharge nozzles and the supersonic shock pulses of the main combustion chamber are introduced into the boiler where they overlapp. 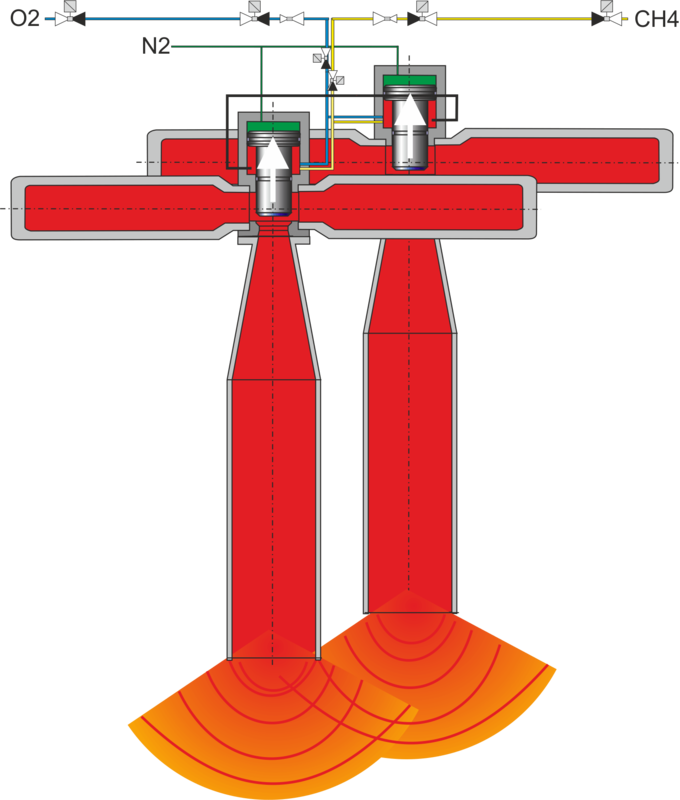 The discharge nozzles transfer the shock pulses into the boiler, where they overlap and then propagate first in a linear, then in a spherical manner. Flue gas, boiler tubes and walls are put into a short oscillation, so that deposits are cleaned off. The effective depth and cleaning effect can typically cover up to 10 m, with best cleaning results for boiler tubes and walls capable of oscillation. 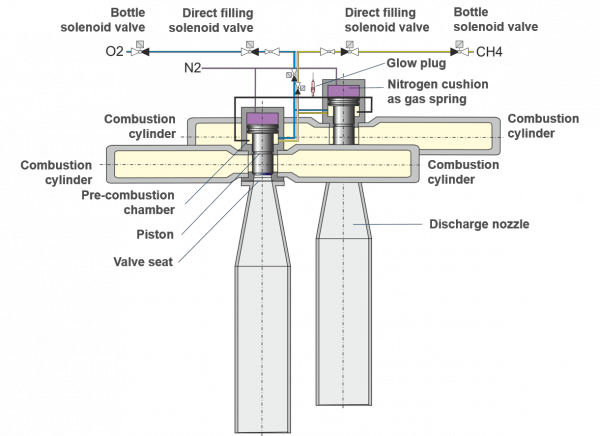 After the pressure waves were discharged from the Shock Pulse Generator, the pistons are pressed against the discharge openings by the Nitrogen gas spring and close the generator gas tigth. The Shock Pulse Generator is then ready for the next pulse cycle. The gas supply for Shock Pulse Generators is easily carried out by means of gas cylinders or small bundles with 200 bar pressure. The pipes distributing the gas to the Shock Pulse Generators should exhibit a minimal inner diameter of 10mm and are operated at a maximum pressure of 40 bar (e.g. material V2A, nominal inner diameter DN10, nominal pressure PN63). If Natural Gas is available from the grid, a small compressor can be installed. Additionally, a Nitrogen Gas Cylinder is necessary for the gas spring of the piston. The Shock Pulse Generator is mounted at the outside of the boiler wall. 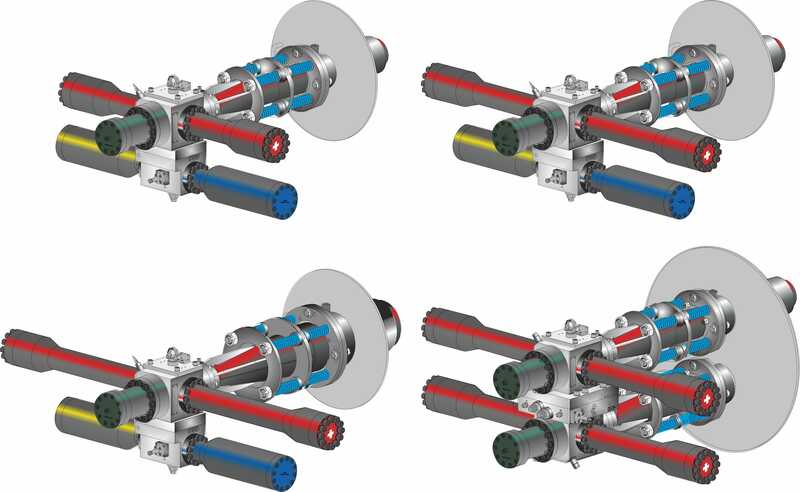 The discharge nozzle is introduced into the boiler by means of a boiler nozzle and is shortened to the same length as the boiler inside wall. The Shock Pulse Generator is hung movable to a crane rail and connected to the boiler flange (DN125 PN16 or DN200 PN6) directly or by means of a spring package. The spring package dampens the recoil towards the boiler wall. The Shock Pulse Generator can be mounted horizontally at the boiler wall or vertically at the boiler roof. We attach great importance to the safety of the Shock Pulse Generator technology. The control of Shock Pulse Generators is carried out by single or multiple control cabinets, which are equipped with PLC and Touch screen-Interface. In case of deviation of standard operation the generator will be shut down automatically. Different standards are available for the signal exchange with the DCS and also with the manufacturer or the maintenance partner. Send operational data of connected Shock Pulse Generators daily to the GateManagerTM, located at Explosion Power’s head office (see scheme above). Each SiteManagerTM communicates solely with the GateManager, to which it was linked to during the setup procedure. The operational data is made accessible to the respective customer and service partner over the SPGLogView web interface. Additionally, the control cabinet’s HMI can be accessed for remote support. The customer is asked each time for his approval, before any remote access is carried out.